Sihl Aquarella2 is an attractive entry level art paper. This product is designed to address both the aqueous inkjet and latex markets for large scale work in institutions such as offices and hotels. For the first time, signage users using HP Latex printers can offer product into the fine art market. 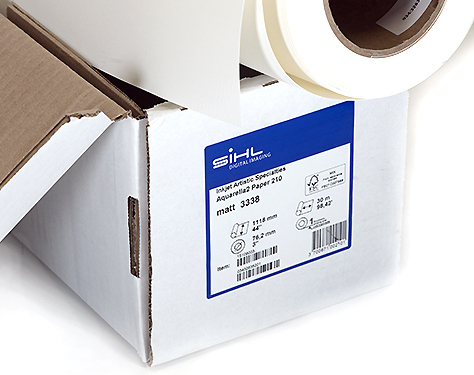 Available in 30m rolls, you can print very large numbers of images without changing the roll. The product performs far better than its 210gsm weight would suggest as it is stiffened alpha cellulose in construction. The product has zero optical brighteners, and resists ink show through. There isn't a better value art paper in the market today. Fine Art Paper 210gsm, Textured Alpha Cellulose, Watercolour Paper, Product of France, Zero OBA, Pigment or Dye.